Cell-based in vitro assays are used throughout the drug discovery and development chain, allowing for high throughput efficacy but also mechanistic-based toxicity testing. A big challenge however is the translation of in vitro assays towards the in vivo outcome. Physiological relevance is a key parameter to improve the predictive power of cell-based assays. The better we can reflect tissue architecture, composition and function the more predictive an in vitro assay will become. The 3D course covers advances in 3D cell culature technologies, assays and their use in drug discovery and development. Course instructors include InSphero Chief Scientific Officer Dr. Patrick Guye, and InSphero Head of Technology Platforms, Dr. Olivier Frey. Complex human 3D tissue models for efficacy and toxicity screenings are becoming increasingly prevalent for efficiently de-risking and streamlining the drug discovery process. This tutorial covers the basics of implementing healthy and diseased human 3D microtissue models for applications such as toxicity testing, Steatotic/Fibrotic/NASH liver therapeutic agent efficacy assessments, diabetes modeling, as well as immuno-oncology applications with screening-compatible endpoints. Moreover, we will also address solutions for integrating these tissue models in automation-compatible body-on-a-chip/microphysiological systems. Aspects comprise: 3D microtissue models for disease modeling and efficacy testing, 3D microtissue models for safety testing, 3D microtissue models for target validation, and screening-compatible body-on-a-chip and microphysiological devices. Tutorial led by InSphero Chief Business Officer Dr. Frank Junker, Chief Scientific Officer Dr. Patrick Guye, and Head of Technology Platforms Dr. Olivier Frey. Complex human 3D tissue models for efficacy and toxicity screenings are becoming increasingly prevalent for efficiently de-risking and streamlining the drug discovery process. This tutorial covers the basics of implementing healthy and diseased human 3D microtissue models for applications such as toxicity testing, Steatotic/Fibrotic/NASH liver therapeutic agent efficacy assessments, diabetes modeling, as well as immuno-oncology applications with screening-compatible endpoints. Moreover, we will also address solutions for integrating these tissue models in automation-compatible body-on-a-chip/microphysiological systems. Aspects comprise: 3D microtissue models for disease modeling and efficacy testing, 3D microtissue models for safety testing, 3D microtissue models for target validation, and screening-compatible body-on-a-chip and microphysiological devices. Dr. Olivier Frey, InSphero Head of Technology Platforms, is the chair for this session in the Micro- and Nanotechnologies track. The next step towards more biomimetic and systemic in vitro models is the design of multi-organ devices, which allow communication of different tissue types. 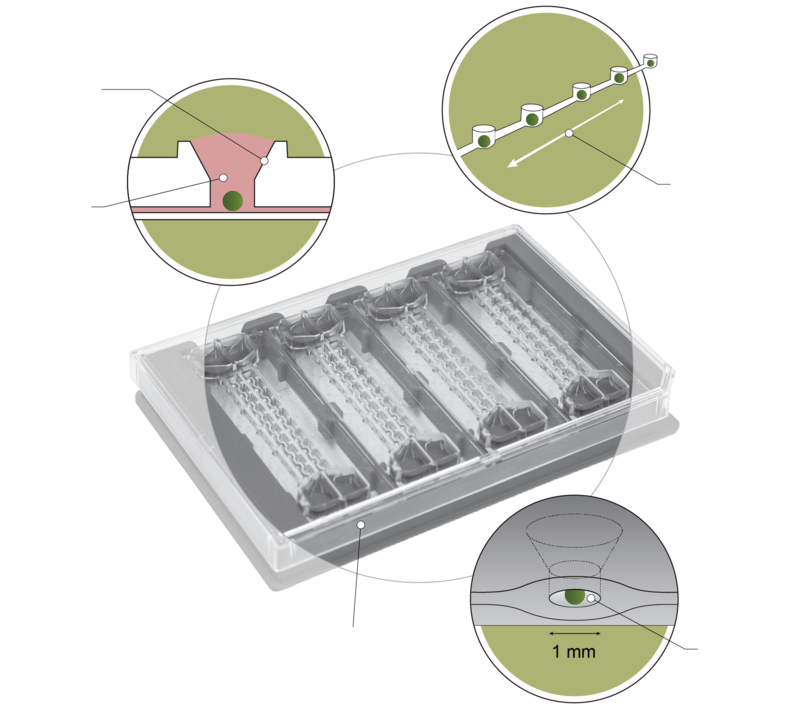 InSphero’s multi-tissue platform features microfluidic channels and chambers that were specifically engineered for culturing of microtissue spheroids under physiological flow conditions. 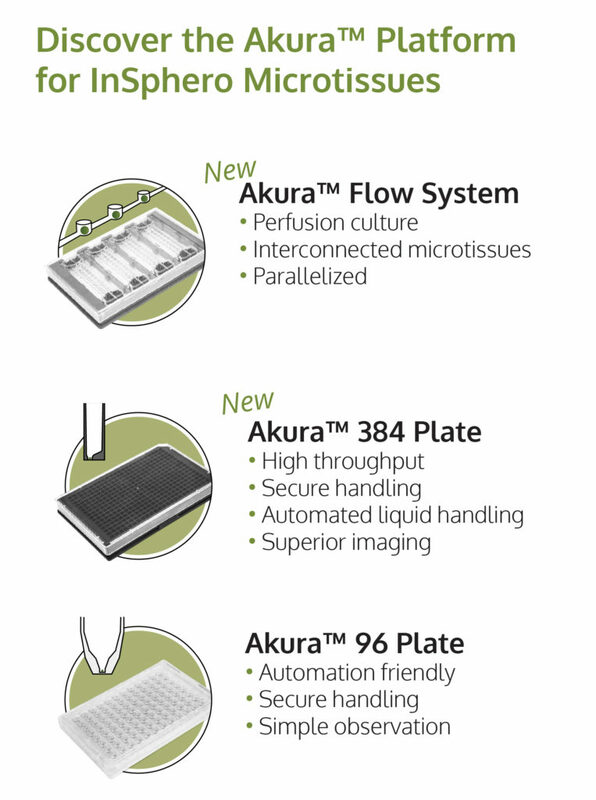 The Akura™ Flow system has a plate-format, is produced completely out of polystyrene, and complies with SBS-standard dimensions for automation. 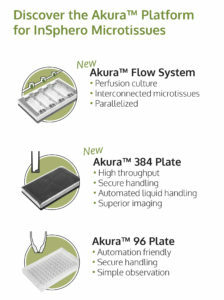 The concept allows on-demand interconnection of up to 10 same or different microtissues per channel in a very flexible way. With the broad range of available spheroid-based organ-models, near unlimited pre-clinical testing applications can be generated using the very same platform.